Post-bankruptcy Detroit is a place of undeniable opportunity, and people from all walks of life are eager to make the most of it. Massive tax foreclosures led to a record 24,000 properties being up for auction this fall, pitting residents against speculators for the chance to buy a home on the cheap. Everyone is trying to take advantage, but not everyone’s advantage corresponds with the best interests of the city. So what is best for the city? It comes down to short versus long-term interests. Renters have shorter-term interests than their landlords and landlords have shorter-term interests that owner-occupants. One who depends on a home to raise their kids in has a different incentive to care for a property than one who sees it as a complement to their investment portfolio. For individuals, homeownership provides security in two major ways: First, by offering shelter, and second by offering stability. For speculators, property ownership provides a low-risk, low-effort form of passive income. A study by the Journal of Urban Affairs bears this out, showing that in Detroit, the prevalence of rental properties is a strong indicator of neighborhood crime (even more so than blight). The type of benefit a property owner gains from owning a property has a direct correlation to how much the community benefits in response. Homeownership matters, and the auction can offer a low barrier to entry into homeownership because it doesn’t require on great credit or a 20-year mortgage. In a city with thousands of poor residents and thousands of cheap homes for sale, the government-run tax foreclosure auction could be a potent democratic tool for advancing the numbers of individual homeowners. Yet it’s not being used that way. Instead, the auction systematically discourages the stabilizing forces of homeownership and while acting as a syphon to concentrate property into speculator’s hands. The auction is fundamentally tuned against residents trying to buy their own homes: Former owners are prohibited by law from participating, while renters are systematically uninformed and disempowered. Information about the foreclosure is difficult to come by, especially for renters whose landlords have a vested interest in keeping them in the dark. The auction itself takes place in the ether of the webisphere so Detroiters without internet rarely know that it exists or how to be a part of it. Beyond that hurdle, the auction comes with increasingly high admission fees and regulations— this year there was a $2,500 deposit fee to place a single bid. The result is a very effective armor against the utilization of the auction as a way to correct the inequalities that cause the problems of its current condition. So if residents aren’t the ones buying, who’s left? The out-of-towners. The same factors that limit residents actually favor speculators. Internet-based sales allow people to purchase property they may never have even seen before, in a format not much different from Ebay. A new feature of the auction this year was an affidavit that required bidders to swear that they did not owe any delinquent taxes in Wayne County. Since only 35 percent of Detroit properties are current on their taxes, this provision eliminates a huge number of existing property owners (if they follow the law). Three of the top four highest bidders in this year’s auction hail from New York, France, and West Bloomfield, respectively. There are predictable results of catering to the speculator and not the homeowners. According to a Harvard study “[Foreclosed] properties that were once owner-occupied often become renter- occupied…. and higher renter- occupancy rates correlate with neighborhood turnover and lower levels of collective efficacy.” Failure of current residents to purchase their homes often leads to them being displaced. A study by Loveland Technologies showed that 1 in 6 occupied homes in the 2014 tax foreclosure auction were vacant within under a year. 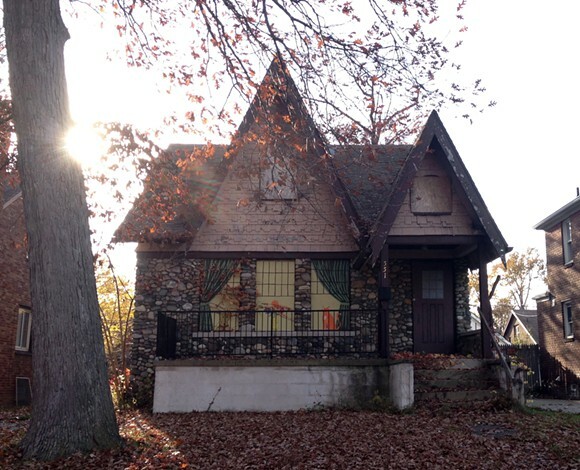 In Detroit, a vacant home is a blighted home, as houses are scrapped days or even hours after the door closes on the former resident. There is an 80% correlation with foreclosure in blight in this city. Since blighted buildings cost big bucks — big taxpayer bucks — to demolish, the city should have a vested financial interest in keeping people in their homes, if not a moral one. This creates an effect of “water everywhere but not a drop to drink” as more and more of Detroit’s massive housing stock becomes uninhabitable. Post-demolition, the vacant lot represents a new kind of stability– emptiness– that is desirable if only because it no longer bears the scars of its loss. Detroit’s Achilles heel is its affinity for the blank slate. Local policies tend to favor dealing with property rather than people, because people are messy and their problems are complex. Federal “Hardest Hit” funds initially allocated for individual foreclosure prevention have been redistributed toward the demolition of buildings that had already been vacated. This is not a reflection of financial values– it actually costs more to demolish a building than to redeem it from foreclosure. Allowing problems to get worse until the people are gone makes for both easier cleanup and fewer witnesses. As squatting and homelessness are criminalized, often the only choice for displaced Detroiters is to leave. The blank slate doesn’t happen on its own, it requires forces like tax foreclosure to drive displacement. A lot of black Detroiters endured the harsh years following the wave of depopulation, disfunction, and disemployment because this was one of the few places they could afford to own property and establish self-governance. That is changing now in a process that goes beyond displacement to replacement. Crain’s Detroit reports that white population is rising while the black population and the city overall is still shrinking. Just as property taxes make it so a person never really owns a home, economic inequality makes it so that Detroiters never really own Detroit– it can always be taken away if you don’t pay. The result is that many black Detroiters have effectively been babysitting property for suburbanites, who are now returning like absentee fathers to reclaim what they left behind after a 50-year hiatus. The battle over property in a city as vast as Detroit is a strange contradiction: It seems there should be room enough for everyone. Stranger still is the fact that the forces that disadvantage Detroiters are not perpetuated by the familiar trope of the “big bad bank” but by the local government, which should presumably work for the benefit of its citizens. Trying to make sense of government policies that actually harm its residents raises the question: What is a city? If a city is a geographic location, Detroit will always be the same, but if a city is an aggregation of its people, these active forces of displacement have the power to alter it forever. Read or view the original MetroTimes posting here. This entry was posted in Detroit, Housing, Non-Fiction, Politics/Social Concerns, Published and tagged Detroit, foreclosure, gentrification, Housing. Bookmark the permalink.